A pleasant half-day trip from Amsterdam is a visit to the picturesque Dutch village park at Zaanse Schans, approximately 15km north of the city. 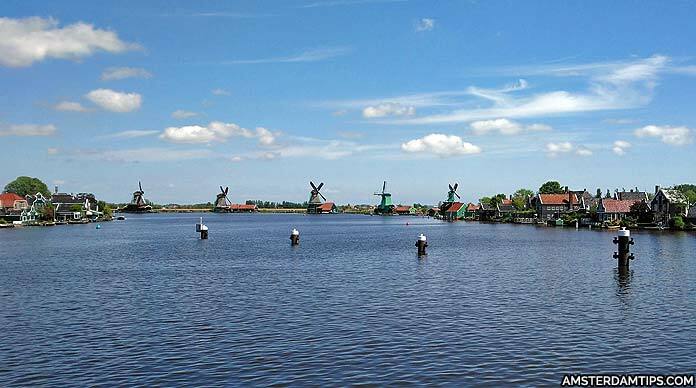 You will find iconic views of the 6 windmills set on the river Zaan, traditional houses, shops and museums. Zaanse Schans has an open-air museum feel and has become a very popular tourist attraction given that entrance into the area is free. The Zaanse Schans visitor information desk (open daily 0900-1700) is at the reception of the main Zaans Museum. The Zaans Museum (Schansend 7, open daily 0900-1700) gives a historical overview of the people and industry of the area. It has a varied collection of paintings, costumes, furniture as well as multimedia exhibits. The museum also houses the Verkade Pavilion which is a history of the chocolate and biscuit maker. Admission costs €10, children 4-17 €6. Museum card holders get free entry. The Albert Heijn Museum Shop (Kalverringdijk 5) is a reconstruction of the first ever Albert Heijn store from Oostzaan dating back to the late 19th century. Today Albert Heijn is the biggest supermarket in Amsterdam and the rest of the Netherlands. Entrance is free, open daily 1000-1630 Apr-Sep, off season – weekends only 1200-1600. The Zaanse Time Museum (Kalverringdijk 3, daily 1000-1700) shows the history of Dutch timepieces with a collection of clocks that chime together on the hour. Standard entrance is €10. The Bakery Museum de Gecroonde Duyvekater (Zeilenmakerspad 4, daily 0900-1700) where you can sample the Duivekater, a famous Zaanse sweet bread. Free entrance. Jisper House (Kraaienpad 4,daily 1100-1600 Apr-Sep) is a fisherman’s cottage from the village of Jisp dating to around 1850. You can try on a traditional local costume. Honig Breethuis (Lagedijk 80, Thu-Sun 1300-1700, closes 1600 off-season) is a 19th century merchant family house. Entrance is €4. The Windmill Museum (Museumlaan 18, 1100-1700 Tue-Fri, 1300-1700 Sat/Sun) has some interesting wooden models of windmills. Entrance €4.50. Visits to the windmills costs €4.50 each or €2 for children 6-12. You will find traditional craftsman at work. The Catharina Hoeve Cheese Farm (Zeilenmakerspad 5) is a replica of an old farm from Oostzaan. Cheese makers wear traditional costumes and offer daily demonstrations. Ever wondered how the ubiquitous Dutch clogs are made? The Clog Workshop (Kraaienest 4) gives you the chance to see a clog maker in action. Entrance is free and the onsite museum houses an impressive collection of wooden shoes. The Weaver’s House (Zeilenmakerspad 8) shows how sails were made using looms. The Tiemstra Coopery (De Kwakels 2) will show you the craft of making wooden barrels which were vital for transporting goods. Entrance to each is €2. 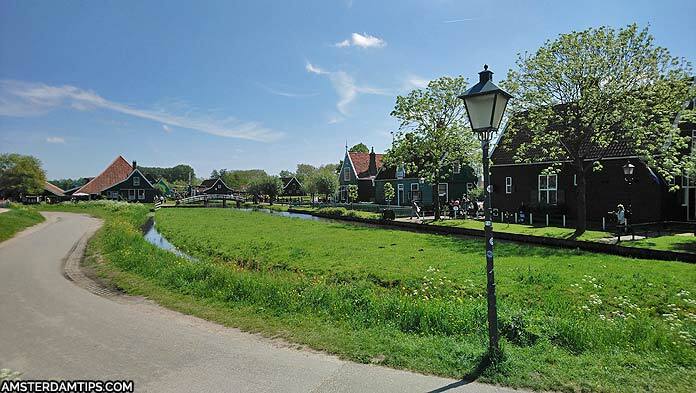 There is a Zaanse Schans card available for purchase (€15, children 4-17 €10) which offers entry into the Zaanse museum, Zaan Time Museum, the Weaver’s House and Coopery. You can choose 1 free windmill visit as well. It may save you a few euros if you are planning to visit a number of museums and a windmill. It is well worth getting out of Amsterdam to have a look around Zaanse Schans, a picture postcard version of a traditional Dutch village in a water and country setting. Tours: It is possible to do a half-day coach tour of Zaanse Schans, with meeting point at A’DAM Toren lookout on the north bank of the IJ, close to Central Station. There are 2 choices if taking public transport to Zaanse Schans. Train: Take one of the NS Sprinter stopping trains from Amsterdam Central (direction Uitgeest, up to 4x hourly) to station Zaandijk Zaanse Schans. A day return (2019) costs €6.60 and the trip takes just under 20 mins. There is a €1 surcharge for disposable tickets. From there it’s about 10-15 minutes walk to Zaanse Schans – just follow the signs. Walk up the road then turn left towards the windmill and then right to cross over the bridge. Bus: Connexxion’s Industrial Heritage bus line (391) runs from the bus station (IJ-side) at Amsterdam Central to Zaandam and the Zaanse Schans windmills. It runs up to 4x hourly and the trip takes about 40 minutes. A 90 minute “Bus Tram Metro” ticket costs €6.50. See our article on Amsterdam transport tickets for more info about the 1-3 day Amsterdam & Region Travel Ticket which could be useful for Zaanse Schans visitors.